For many, the main attraction of the markets is punsch, the hot wine that comes in many different varieties. A quick survey showed the following types of punsch were being offered for sale at different booths: Christkindlmarkt, hinbeer, erdbeer, heidelbeer, kirsch, orange, beeren, tequila, zwergerl, kokos, Jack Daniel’s, bärentöeten, Mozart, amaretto, schoko-rum, apfel-zwetschen, vanielle-kirsch, and energy. (Other varieties are available at other Christmas markets.) For revelers who do not like punsch, glühwein is also available. At the Rathaus, the price is €4 per ¼ liter, served in a specially made mug. For each mug, a returnable deposit of €3 is required. Of course, punsch tastes best in cold weather when it warms the hands and gullet, helping to fend off frostbite. Sadly for the vendors, so far November weather has been unseasonably warm. At present, the chances of getting frostbite in Vienna are slim. Such weather dampens the need for the warming effects of punsch and brings to mind objections to opening the Christmas market SIX WEEKS before the actual holiday. Of course, it is not surprising to see the Wiener Christkindlmarkt opening so early, and the packed Rathaus square on Saturday night (November 14th) showed why. (The crowds came even though the opening ceremonies were canceled due to the terrorist attacks in Paris.) This market is popular, attracting tourists from near and far. Also important, it is a big enterprise employing many people, and the market for Christmas markets is increasingly competitive, with new and expanding Christmas markets popping up around Vienna and in other Austrian cities and in the rest of Europe. The Vienna Chamber of Commerce estimates that the Rathaus market will have 3 million visitors in 2015 with each Viennese spending 22 euros and each tourist spending 36 euros. I had never realized the scale of the work needed to create Christmas market until this year when I was in Vienna at the beginning of November. On November 1, work had already begun on the Rathaus market with an impressive number of trucks bearing tradesmen and -women parked in front of recently installed temporary structures (booths, stands, huts, stalls?) from which goods are sold. Not only did the electrical system for this village need to be wired, but the huts had to be stocked and a massive array of lights and decorations installed. One Sunday as I passed by the Rathaus on a Strassenbahn, I was astounded to see work being done by an army of electricians: usually unions in Austria make sure their members do not have to work on Sunday. The cost for overtime work must have been substantial. For those who have not been in Vienna, you should know that its city hall, the Rathaus, is a massive gothic building constructed on Vienna’s famous Ringstrasse. The Ringstrasse is a boulevard that was created when Emperor Franz Joseph was persuaded in the 1850s to allow the wall protecting the central city to be demolished. The new street opened 150 years ago. As part of the grand plan to replace the wall, many important public buildings were built along the Ring. The Rathaus and its park, which takes up four large blocks, is located between the University and Parliament buildings. It lies across the street from the Burgtheater. In front of the massive Rathaus building is a paved public square and a large park. The 150 or so huts/booths/stands/stalls making up the market are located in the paved part of the square. The park is the setting for the "Magic of Advent" with decorations and children’s attractions. At night, the market and the Magic of Advent are a cornucopia of lights and sounds. This year, the Magic of Advent is celebrating its 30th year of operation at the Rathaus The Wiener Christkindlmarkt has been there about ten years longer. Of course, the history of Vienna’s Christmas markets goes back to a much earlier time. The first records of a Christmas market mentioned “huts” in front of Saint Stephen's Cathedral in 1626 that were set up on December 16 and 17, then were taken down on 9 January. At these booths, bakers, gingerbread vendors and confectioners sold their goods. This market was shut down in 1761. The Christmas market restarted in 1764 when the Saint Nicholas and Christmas Market operated at the Freyung (1st District). It stayed there until 1842, when it moved to Am Hof, a large open area just a couple of blocks from Freyung. According to a history of Vienna’s Christmas Market, “Every year on 5 December, 132 "crèche market stands" were put up and remained there until New Year's day.” In 1903, the stands at the market were illuminated by electricity for the first time. 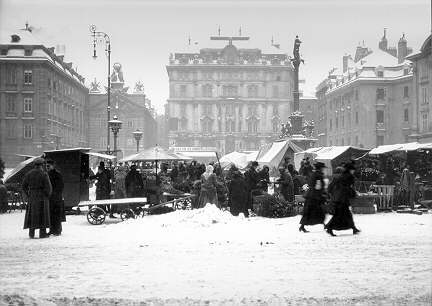 The Christmas market had a home at Am Hof until World War I. The Christmas market was closed down during World War I and for some years after its end. It restarted in 1923, when it was held at Freyung, then in front of St. Stephens from 1924 to 1928. After that, it moved to Neubaugürtel before returning to Am Hof from 1938 to 1942. In 1943 the market was once again held at Stephansplatz. In 1944 and 1945, Vienna did not have a Christmas market. From 1946 through 1948, the Christmas market was open at the square in front of the Messepalast (trade fair palace) located at the end of Mariahilferstrasse. The Christmas market moved back to Neubaugürtel in 1949 where it stayed until 1957. Then from 1958 to 1974, the Christmas market had a home in front of the Messepalast (which is now the site for art museums). 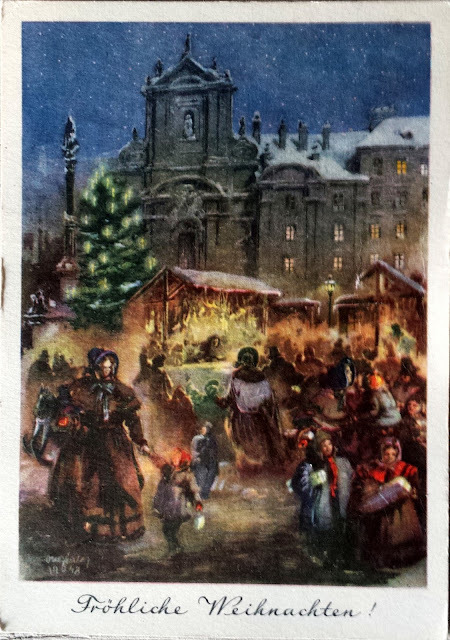 Since then the Rathaus plaza and park have been the permanent home of the Wiener Christkindlmarkt. The Magic of Advent was added in 1985. My personal experience with Christmas markets started in December 1967 when I was a student in Vienna. One day when headed to the Volkstheater, I accidentally stumbled on a row of huts located at the end of Marihilferstrassse along an ally in front of the Messepalast. The huts were lit for Christmas and were selling a variety of goods as well as food and drink. The main thing I remember from that market is that I learned that beer companies were permitted during the holiday season to make and sell a Christmas brew with a higher percent of alcohol than normally allowed. I was not again in Vienna during December until 2000, when came for a short vacation. I quickly discovered the magic of the Wiener Christkindlmarkt at the Rathausplatz with its bright lights, festive spirit, and hot wine. By that time, a few other Christmas markets had begun operation, including a smaller, more intimate and manageable market at Freyung . It was (and still is) called the Old Vienna Christ Child Market (Altwiener Christkindlmarkt). Its lighting is more subdued and the crowds less intrusive than the bigger markets. Since 2000, I have been in Vienna eight times during December to visit the Christmas markets and take advantage of other events the city has to offer. Each time I have returned, I have found new Christmas markets or expansions of the older markets. Vienna had only the original market at the Rathaus until 1986 when the Old Vienna Christ Child Market at Freyung opened. 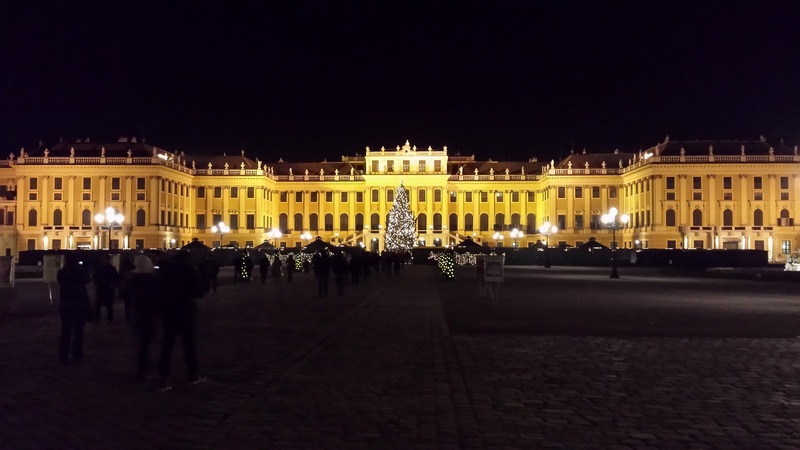 No only long after that, new Christmas markets were held at Schönbrunn and Karlplatz. More recent are the markets at the Old General Hospital (now called Unicampus at Alserstrasse), Belvedere Castle, Spittelberg, and Maria Theresia Platz. In the past few years, markets have been added along St. Stephens Church and near the giant Ferris wheel in the Prater. 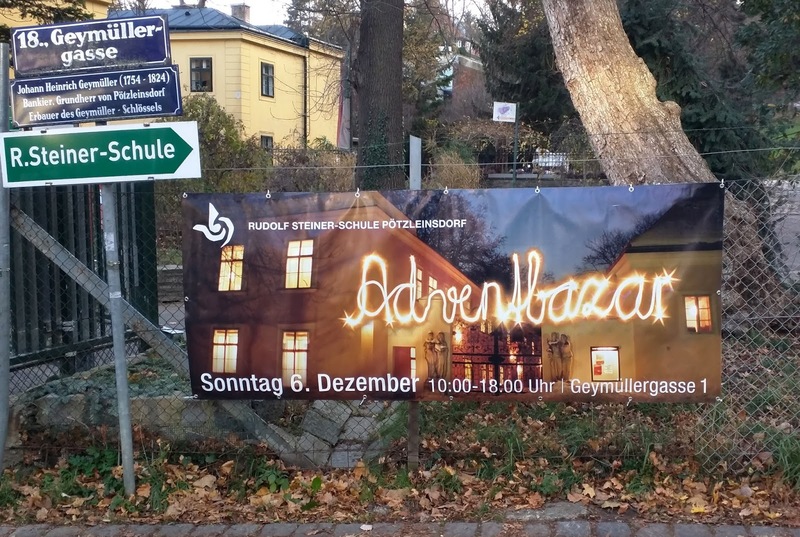 The newest Christmas market is the k.u.k. Weihnachtsmarkt am Michaelerplatz. I do not remember it being around in 2013, the last time I was in Vienna in December. Also, on weekends you in late November and in December, Christmas markets are held at locations in many different neighborhoods, often to raise funds for charities and non-profit organizations. If you are in Vienna, keep an eye out for announcements of these local markets. The arrival of the Christmas markets in Vienna provides a good opportunity for locals and visitors to enjoy some of their favorite places in the city in the glow of mostly tasteful and colorful decorations. They provide a good excuse to be outside in colder weather, joining others in a festive atmosphere. For those who care about the traditional elements of Christmas, decorated Christmas trees can be found, as can nativity scenes and other representations of the religious side of the holiday. For those who do not care so much about those things, lots of different types of punsch can be sampled before Christmas Day.